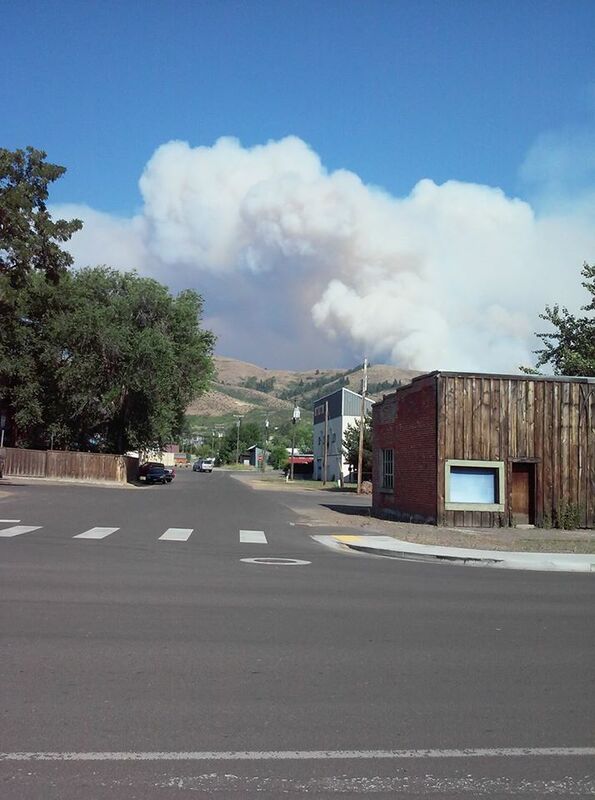 How does a Missouri farm girl wind up in Idaho watching the smoke from a wildfire that threatens to consumer her adopted town, anyway? That’s a complicated question. The simplest answer is that my husband made plans that did not include me. Our divorce was final at 9:26 am on February 14, 2003. Three days before what would have been our 25th anniversary…That was a fast-moving wildfire that devoured a lot of personal and metaphorical real estate. I could let the fire of intense anger and rage destroy me, or I could adapt to the changes that I could not control. I decided to adapt…save what I could of my old life – the one that I had all planned out – and to build a different life. One I hadn’t even imagined. I decided to let the fire set me free to do something unexpected. And that’s how I eventually got to Idaho. The wildfire that’s burning real forest just over the hills 4 miles from town is called the Mesa Fire. It began around 8 pm on July 26, 2018. Sparks from a blown tire on the highway ignited the dry grass. This one, at least, was accidental. I could see the thick, angry smoke from my front window as acres of dry grass and sagebrush burned. I packed my bags in case I had to evacuate with my little dog and my 2 cats. I’ve learned what to save and what to let go of without a fight because I’ve done it before… For a few days it looked like the town of Council was in danger. I can’t say enough about the bravery and adaptability of the firefighters! They saved the town. July 27, 2018. The Mesa Fire burns just over the hill from Council, Idaho. This was probably the scariest day for me. Today I am thankful for the bravery and skill of the firefighters. Pray for rain, pray for the lives and property in danger, everywhere. Pray for all the firefighters doing battle with wildfire this week. I knew you have a real gift for writing and this is just a sample. Congrats on once again going out on that limb and proving what a strong person you’ve become! Looking forward to much much more! Thank you so much! It means a lot to me that you think so. Well done, my friend. I’ve enjoyed following your daily “Thankful for…” posts and your new adventures in Idaho. We miss your smiling face on the corner every Sunday rain or shine. I miss you guys, too. Thank you for reading and commenting! I am so very proud of you for writing this and for at least a thousand other reasons. Refer to “the list” for starters, as needed. Thanks Sis. I’ve been putting it off for a long time. Just so you know, “The List” is framed, and on my bedroom wall.